Now, sources say that Yahoo has closed in on an acquisition that could potentially boost its role in mobile further: it is buying Flurry, the mobile app analytics and advertising startup, with a price that could be anywhere between $300 million and $1 billion. Kara Swisher is also reporting that Yahoo is interested in the company. Update: A source is telling us that the price was substantially lower, clocking at around $200-$300M. And Yahoo has confirmed the acquisition. We have reached out both to Flurry and Yahoo for comment. 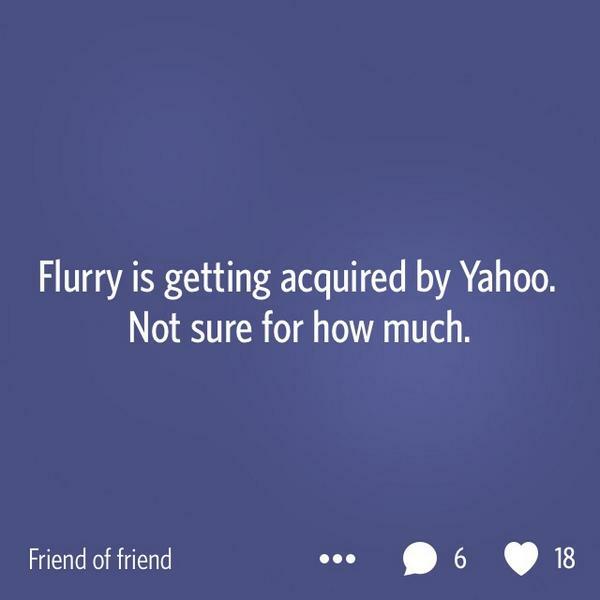 We’d been hearing for a while now that Flurry was on the market, with one source suggesting it was looking for a price of around $700 million – $800 million. Other potential buyers, we heard, included Amazon. But given how far Amazon itself has advanced in building its own mobile analytics services to court more developers, it looks like that ship sailed on its own. One source close to Flurry says the company has been “racing toward a sale” and confirmed that Yahoo was looking like the most likely buyer for a while now, with a sale made public by the end of the summer. Founded in 2005 and headquartered in San Francisco, Flurry is one of the largest companies in the area of app analytics. It’s an area that has seen some consolidation. For example, Onavo was acquired by Facebook. AppAnnie has acquired Distimo. And Twitter has also made a number of acquisitions that have boosted its mobile analytics capabilities. In Flurry’s own words, “Since the launch of the smartphone, Flurry has helped grow the app economy into a $100+ billion industry.” By that, it’s referring to the fact that it works with some 170,000 developers, picking up data from 150 billion app sessions each month, to provide information to app publishers about their audiences, app usage and app performance, providing insights to improve how apps work. And to improve how apps make money. Flurry uses that data, for example, to power its advertising platform, which is used by brands to target specific audiences on apps in Flurry’s network, and by developers to monetise their apps with more relevant inventory. It has raised close to $74 million, with backers including Borealis Ventures, Crosslink Capital, DFJ, Draper Richards, First Round, InterWest Parnters, Menlo Ventures and Union Square Ventures. Of course, Yahoo seems to be a strong candidate for lots of wild mobile acquisition rumors. But you can see where Flurry fits well with Yahoo’s existing business focus, specifically across mobile, advertising and B2B products. Especially as the company continues to see pressure on its more legacy businesses like desktop display advertising revenue and search revenue. Specifically, what Flurry could give to Yahoo is not just a boost in mobile advertising revenues, but, as Yahoo builds out its ad tech business, a more central role in how others are monetising and using mobile. Effectively, this gives Yahoo another strong string to its mobile bow: while it builds out its own apps and app inventory, and advertising to run across them, Yahoo could be bringing in a platform that could become the go-to place for other mobile players to boost and develop their own app businesses. In the search for new growth and business lines that could potentially give the company a stronger counterbalance against Google, Yahoo has been building up its mobile business, both in terms of products and talent to develop and run them. A lot of this has come by way of acquisitions. Since Marissa Mayer took over as CEO in 2012, there have been 30 known acquisitions either directly or indirectly related to mobile products (we’re listing them below for those interested in keeping track). That’s not counting IntoNow, a social TV app Yahoo acquired in 2011 before Mayer joined the company. IntoNow’s co-founder and CEO Adam Cahan is now the SVP overseeing all mobile and emerging products at Yahoo. Article updated to reflect pricing information and that the acquisition has been confirmed.